The Bintje potato has been around since 1911. 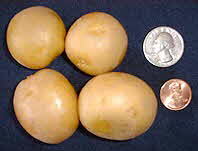 Small to medium sized round tubers with golden skin and yellow flesh. A true waxy yellow potato that is very versatile to cook with. One of the most commonly grown potatoes in Europe.